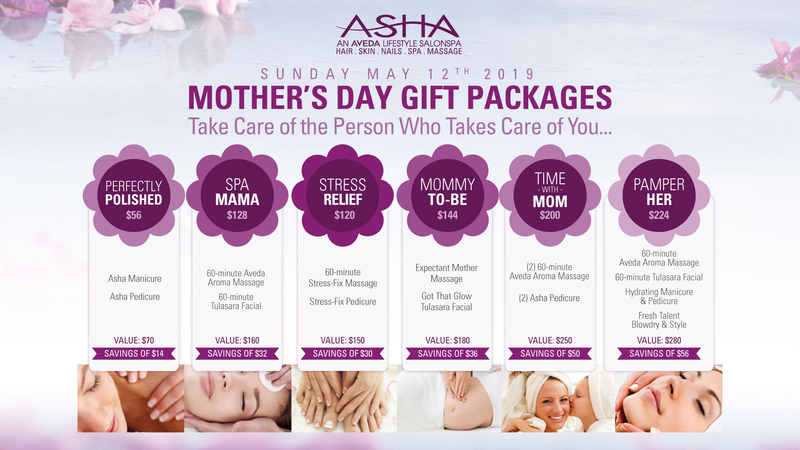 Mother’s Day Spa Packages…. Take Care of the Person who Takes Care of You! – Enjoy 20% off luxury experiences! 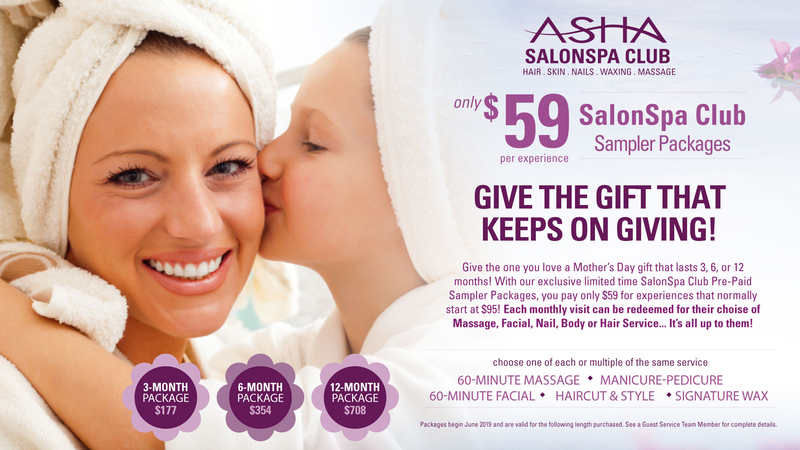 Give Mom the gift of luxury experiences with Asha SalonSpa Mother’s Day packages! Each of these carefully curated Spa packages are customized to enjoy and maximize relaxation for 20% less than if they were experienced alone. 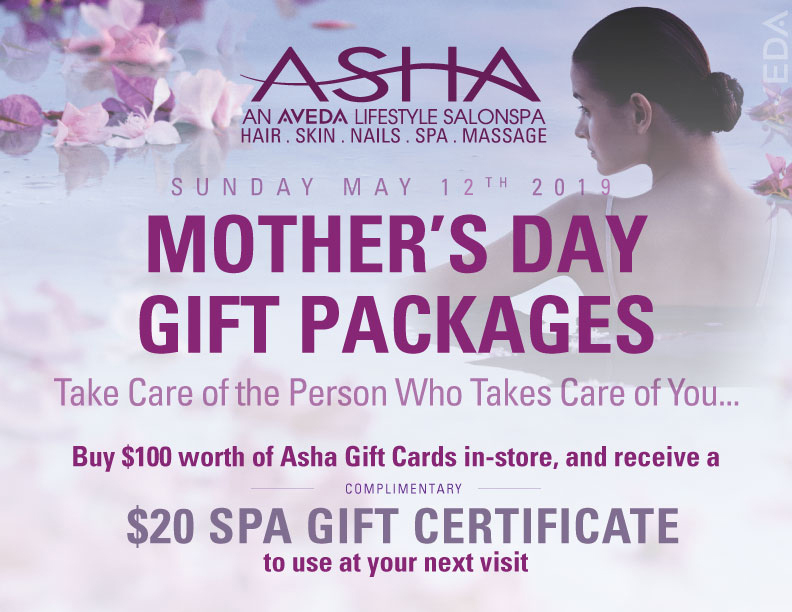 Visit your preferred Asha SalonSpa location today to make your Spa package purchase or visit the link below to purchase online. Packages redeemable with select Fresh Talent technicians only, upgrade to a higher Talent Level for an additional dollar amount. Prices listed are for Rockford Location Only. All Services in a Package must be experienced together on the same day. Packages are redeemable Monday-Friday only with select technicians. See a Guest Service Team Member for full details. Give the Gift of Love that Keeps on Giving! Give the one you love a Mother’s Day gift that lasts 3, 6, or 12 months! With our exclusive limited time SalonSpa Club Pre-Paid Sampler Packages, you pay only $59 for experiences that normally start at $90! Each monthly visit can be redeemed for their choice of Massage, Facial, Nail, Body or Hair Service… Its all up to them! SalonSpa Club is only offered at our Rockford Location. All Services in a Package must be experienced together on the same day. Packages are redeemable Monday-Friday only with select technicians. See a Guest Service Team Member for full details. Give $100 and Get $20 for Mother’s Day! Buy $100 worth of Asha Gift Cards in-store and receive a $20 Spa Gift Certificate to use at your next visit! Some restrictions may apply. See a Guest Service Team Member for complete details.